Fredericton has everything from history to art to live theatre. This provincial capital lies in the southern central part of the province. 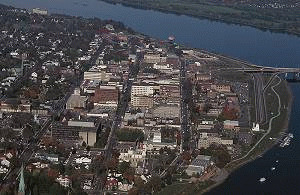 The city's Southside with downtown and 2 universities are on the opposite bank of the St. John River from the city's Northside with its suburban neighbourhoods, retail outlets and businesses. The area is home to around 85,688 people. Fredericton is home to the comprehensive, multi-campus University of New Brunswick and the smaller Catholic St. Thomas University. Higher culture can also be found at the Beaverbrook Art Gallery which features Group of Seven and other Canadian artists' works. The Playhouse in the Tannery Entertainment District serves as a theatre, concert and other entertainment venue, alongside the District's local pubs presenting live music. The city's joie de vivre can be witnessed at the almost monthly variety of major festivals, including a Harvest Jazz & Blues Festival held every Fall. The town is also a scenic showcase of Victorian architecture with elm tree-lined streets. Former Officers Quarters in the Garrison District now form the York-Sunbury Museum. For outdoors enthusiasts there are 70 kms (43.5 mi.) of trails for walking or biking along the St. John River shores, and boat tours or canoes/kayaks on the river. Nearby Mactaquac Provincial Park, 15 km (9.3 mi.) west of Fredericton, offers two beaches, hiking trails, a campground, and a golf course. Located along the scenic Saint John River and less than 10 minutesâ€™ drive from central Fredericton, this inn features daily continental breakfast. Free Wi-Fi is offered in every room. Cable TV, a microwave and a small refrigerator are found in each dark wood-furnished room at Knights Inn Fredericton. Air conditioning and a telephone are also included. Conveniently located near Fredericton Mall, Fredericton Botanical Garden and Odell Park. The University of New Brunswick-Fredericton and St. Thomas University are located minutes away. Shopping is available at Regent Mall, King's Place Mall and the W. W. Boyce Farmers' Market. In the historic Garrison district, explore a charming neighborhood and enjoy a visit to the Lighthouse Adventure Centre. Ideally located moments away from the city center, this suite-style property offers relaxing amenities with a prime location just minutes away from the best shopping, restaurants and attractions in Fredericton. Amsterdam Inn features a continental breakfast serving a wide variety of hot and cold items for a good start to a busy day. This hotel, located along the River Valley Scenic Drive, is a 15-minute drive from downtown Fredericton, New Brunswick. It offers an outdoor pool, free Wi-Fi and an authentic German restaurant. Each air conditioned room is traditionally styled. Cable TV, a seating area and a clock radio are included. Many rooms at the Inn have a microwave and small fridge. Situated on the beautiful riverfront in downtown Fredericton, New Brunswick, this luxury hotel offers exceptional service and a variety of modern amenities. Fredericton city centre is 2 km away. Every stay can be relaxing and enjoyable when at the Delta Fredericton. With on-site spa facilities, a state-of-the-art fitness center and luxurious room furnishings, there is something for everyone. This hotel offers rooms with dining areas and balconies offering a view of the St. John riverfront. The Motel is just 3 kms from the bridge into historic downtown Fredericton. Guests of the Motel will find free cable TV and Wi-Fi. Each room has a seating area, as well as a microwave and refrigerator. Thereâ€™s an on-site game room, and meals and drinks are available in the Cannon's Cross Pub. Located in Fredericton, New Brunswick, this hotel features an indoor pool with hot tub and guest rooms provide free Wi-Fi. The University of New Brunswick is 2.7 km from the hotel. The rooms at Fredericton Inn provide cable TV and coffee facilities. Each room is also furnished with a work desk. A gym is available at the hotel along with a business center. This Fredericton hotel has an unbeatable location with luxurious amenities. There’s a with a fitness facility, hot tub and heated indoor pool to enjoy after a day of business, shopping or fine dining. Enjoy in-room whirlpools, spacious suites, free Internet, and kitchenettes. Breakfast is on us and features a generous buffet of pastries and fruits, hot waffles, eggs, sausage, cereal and breads. Located on the shores of the beautiful Saint John River, this convenient hotel provides contemporary amenities and easy access to downtown Fredericton and New Brunswick area attractions. Ramada features a Mediterranean-style indoor courtyard with a heated pool, hot tub, pool-side bar, games area and fish pond. Have some fun with a game of pool or relax by the waterfall with a good book. Our Fredericton, New Brunswick hotel is the first choice for accommodations for business and leisure travellers. Free high speed wireless internet service, free deluxe continental breakfast, free movie rentals, free local telephone calls, free morning newspapers, exercise room, new lobby business centre, 99 spacious guest rooms, two room suites and on-site meeting facilities. Budget Motel Hotel Fredericton 1214 Lincoln Rd. Charlotte's Web Bed & Breakfast B&B Fredericton 470 Charlotte St.
Howard Johnson Plaza Hotel Fredericton Hotel Fredericton 958 Prospect St.
Parkview Bed & Breakfast B&B Fredericton 236 Odell Ave.
Skyline Motel Hotel Fredericton 502 Forest Hill Rd.